Elizabeth MacIsaac enjoys a reputation in her own country and abroad as an artist of great expressive range and technical accomplishment. Her reputation is very much centred around her performances of early music but in the past several years has expanded her vocal interests to include music from 18th to early 21st century. A strong interest in contemporary music has led to premieres of works by international composers such as David Loeb, Nicolai Sani and Canadians John Abram and Nicolas Fairbank. Ms. MacIsaac lived and performed throughout Europe from 1990 to 1996, sustaining a busy schedule as a touring artist. Among other engagements, Ms. MacIsaac performed extensively with the French early music ensemble Musicantique. In 1994, she travelled to Dublin as featured guest artist for an international conference of Passionist Monks, performing "A Musician's Tour of 17th Century Italy". Since relocating to Victoria in 1996 Elizabeth MacIsaac has continued her active and varied career as a performer. Ms. MacIsaac is the founder of the Victoria based women's medieval vocal group "Ensemble Laude", which recorded its first CD in 2002. In the West, she has performed on several occasions with the Portland Baroque Orchestra, The Victoria Symphony, the St Cecilia Orchestra, CappriCCio Vocal Ensemble and the Burney Ensemble. As well she has appeared with the Palm Court Orchestra, and the Whitehorse Community Choir. 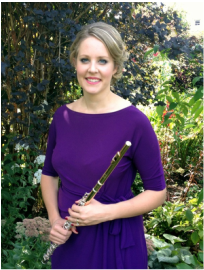 Emily Nagelbach is second flute/piccolo with the Vancouver Island Symphony and is Head of the Winds & Brass Department at the Victoria Conservatory of Music (VCM) in Victoria, British Columbia, Canada. As a freelance musician, she has performed with many orchestras, including the Vancouver Symphony Orchestra and Victoria Symphony Orchestra. Emily holds an AVCM from the Royal Conservatory of Music (Toronto), a B.Mus. in Performance and Theory from Wilfrid Laurier University and a M.Mus. in Performance from the University of British Columbia, studying with Amy Hamilton, Lorna McGhee and Camille Churchfield. Prior to entering university, Emily studied with her friend and mentor, Mary Byrne. As a soloist and chamber musician, she has won numerous competitions, including the Vancouver Friends of Chamber Music Competition and the Kitchener-Waterloo Chamber Orchestra Concerto Competition. Emily has been broadcast on CBC Radio as guest principal flute with the Victoria Symphony Orchestra and has recorded for the Canadian Music Centre with the WLU Flute Ensemble and UBC Symphony Orchestra to critical acclaim. She is a member of the Continuum Consort, with whom she toured South Korea in recital. Emily teaches flute, piccolo, baroque flute and theory to students of all ages and levels and piano and fife for young beginners. Ms. Tatiana Kostour, Moscow born, is a violinist from The Ukraine. In 1991 she graduated from Kiev Conservatory of Music and in 1993 immigrated to Canada. Besides performance, studying pedagogy, method of teaching and practical teaching courses under supervisions of very fine Ukrainian teachers, Tatiana always stood out with the highest marks in performance and teaching. Many years of polishing her teaching techniques brought to Ms. Kostour very successful results. A number of Tatiana’s students have received Gold and Silver medals from The Royal Conservatory of Music and first places from The National Canadian Music Competitions. In addition to these awards her students have received scholarships from Regional and Provincial Kiwanis Music Festivals in Ontario, Youth Symphony orchestras. ​Her love of music and warm personality, in addition to her unique interpretations of music and attention to detailed work on the techniques of violin playing, is reflected through high quality performances of her students. In 1999, she received her three year Diploma in Performance from Wilfrid Laurier University. Before moving to Victoria in 2011, Tatiana performed with the Windsor Symphony Orchestra, Brantford Symphony, London Symphony, Thunder Bay Symphony, Niagara Symphony, Kiev National Radio and Television Symphony and many chamber performances. In 2007 she produced a series of six CD’s under the title “Royal Sequence” for violin students preparing for violin exams. Douglas Hensley received degrees in guitar performance from the San Francisco Conservatory of Music. In California, he founded and directed such chamber ensembles as Drifting Leaves (flute, viola, guitar) and the Lennon-Stravinsky Quartet (soprano, flute, harp, guitar). He also made guest appearances with Composers, Inc., Earplay and the Oakland Chamber Symphony, as well as the Symphony Orchestras of San Francisco, Berkeley and Marin. He co-founded and co-directed the contemporary music ensemble ISKRA with conductor Kent Nagano, recording Frank Martin's Poemes de la mort. Since moving to Victoria, he has been very active in the performance of early music on period instruments and has performed with Anima, Ensemble Laude and Les Violes de Ste Colombe. As a guitarist, he has appeared numerous times with the Victoria Symphony and soloed with the Civic Orchestra of Victoria. Mr. Hensley has commissioned and premiered over 50 works by composers from many different countries and he has recorded a wide variety of pieces on various instruments. He is on the faculty of the Victoria Conservatory of Music, where he teaches guitar and lute. He also plays and teaches the classical Persian instruments tar, setar, santur, and oud, which he studied in California and Paris.